Honestly, I'm not usually a big fan of white chocolate. It's a little too sweet for me. Which made me think that, a la my Salted Oatmeal Cookies, adding a little saltiness would provide an excellent balance to the sweetness. Basically, I solved one problem -- I got rid of the addictive chocolate pretzels -- only to create a new one -- we ate all the damned cookies. So you see that cute little gift box in the photo? Yeah, it never made it out the front door. I think I just need to surrender to the fact that we have no willpower. 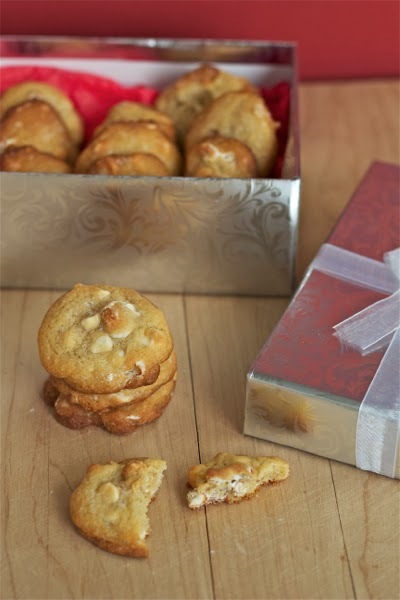 As written, this recipe makes about 2 dozen cookies. Trust me, you'll want to double it. In a small bowl, whisk together the flour, baking soda and salt -- set aside. Using a mixer, cream together the butter, both sugars and vanilla until light and fluffy. Beat in the egg and then gradually beat in the flour mixture. 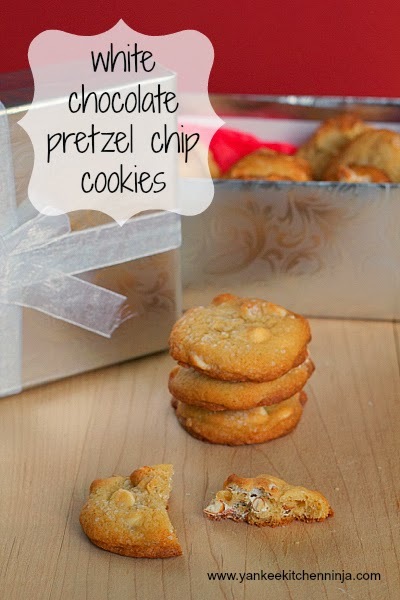 Gently stir in the chocolate chips and pretzel pieces. Drop by heaping tablespoon onto parchment-lined baking sheets (give them a little space to spread). Bake for about 8-10 minutes or until golden. Cool on baking sheets for 2-3 minutes and then transfer to a wire rack to finish cooling. Next year we'll have to look at the catalog more closely -- with cookies in mind!! 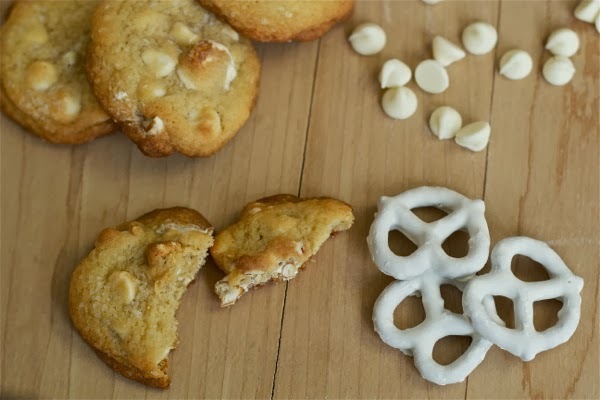 These cookies look so soft and yummy, I can't no to chocolate and pretzels! They are a match made in heaven, aren't they?!! I can SO relate to the willpower thing! Seriously, we'd have eaten the whole batch too. Great looking cookies! Haha! And I was hoping you had saved me a cookie this time, Mrs. Ninj! I'm a sucker for salty and sweet together, too.